New Zealand prime minister Jacinda Ardern has given a new meaning, if not strong imagery, to the term “working mom” with the visually compelling sight of bringing her newborn baby to the United Nations general assembly meeting. Ardern made history as the first female world leader on Monday evening by bringing her infant daughter with her to the UN assembly, even playing with the baby before giving a speech at the Nelson Mandela peace summit. 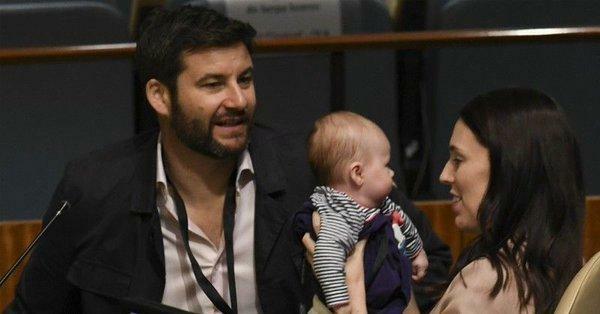 Joining Ardern to the UN assembly meeting is her partner, Clarke Gayford who held the three-month-old baby on his lap while Ardern spoke. The prime minister decided to bring her baby to her six-day trip to New York because she is still breastfeeding. Just last week, the rules in New Zealand were tweaked to allow the prime minister or ministers to travel with a nanny on overseas assignments, with the costs for such being covered by the taxpayer. For their New York trip, Ardern clarified, however, that she will shoulder the tickets and expenses of her TV presenter partner since Gayford will hardly be required to attend official spousal engagements, while he will be mostly tied to taking care of their baby. Ardern also gave her first speech in New York on Sunday at Unicef’s social good summit, restating her commitment to ending child poverty and making her country the best place in the world to be a child. Ardern has always expressed that iw till be norm someday for all women to have the same freedom and option to balance career and parenting. She also won hearts for bringing her baby to the UN summit.